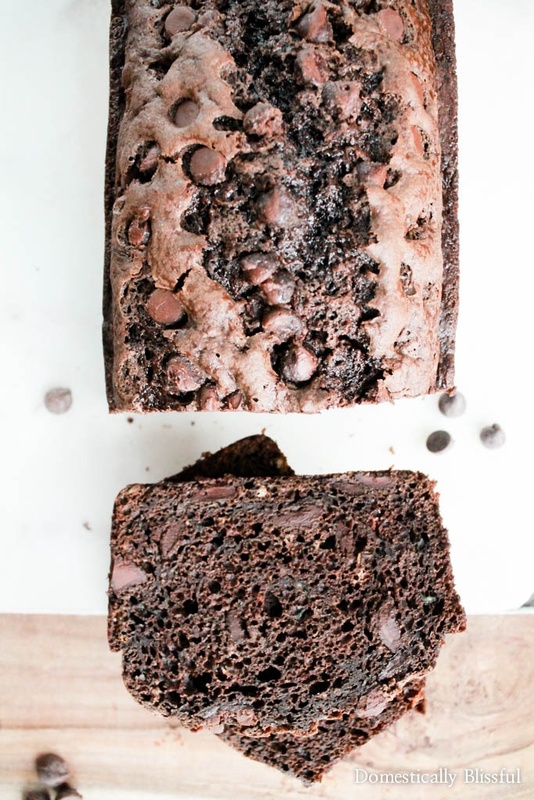 This Double Chocolate Zucchini Bread is very rich & while it is a chocolate lover’s dream come true it is also known as “death by chocolate zucchini bread!” You’ve been deliciously warned! 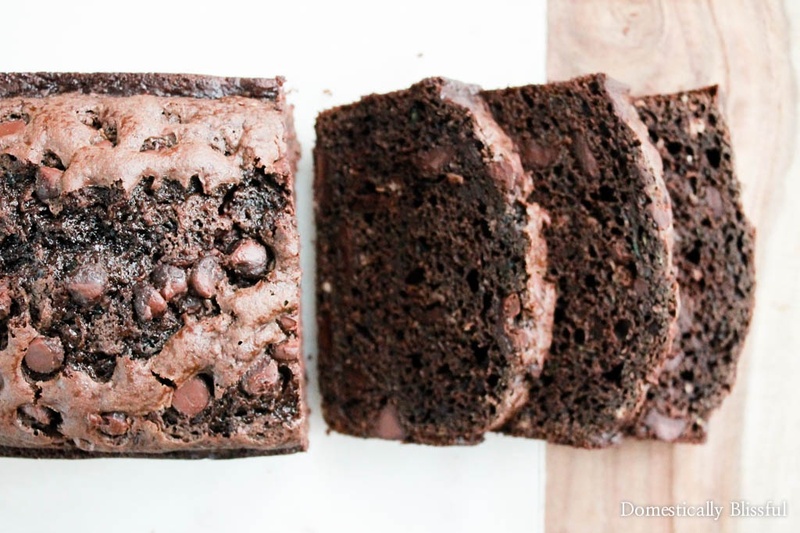 Oh how I love you Double Chocolate Zucchini Bread! You are dark, rich, & full of chocolatey goodness. A few weeks ago I decided to create Double Chocolate Zucchini Bread, but not having a kitchen made that seemingly impossible. So I gathered up my ingredients & headed over to my parents house. I made 2 loaves, using this Zucchini Bread recipe as the base, & then proceeded to have everyone on both sides of our family try the bread. Whose name, by the way, confessed everyone because by the looks of it they had thought I had brought cake. My sister (in-law) Kelly LOVED it & called it a chocolate lover’s dream come true. My father (in-law), who also enjoyed it (although not to the same degree as Kelly), dubbed it Death by Chocolate Zucchini Bread. And while I toyed with the idea of calling it Death by Chocolate Zucchini Bread I decided that I didn’t want people to think they might actually die by eating it, or that I was being overly dramatic in my titles. 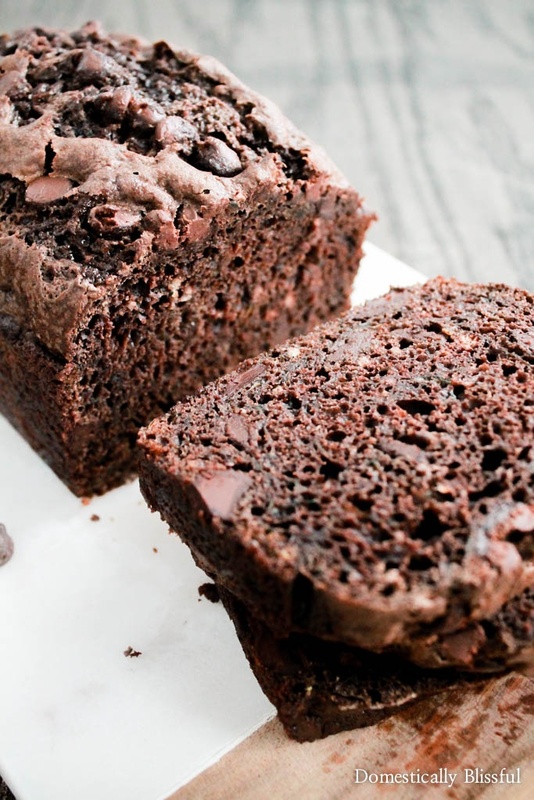 But seriously, this Double Chocolate Zucchini Bread is very chocolatey! After getting feedback from 20+ people I decided to cut back just a smidgen on the chocolate chips. But don’t worry you aren’t being gipped on chocolate, your tastebuds will be well entertained by this cake-like Chocolate Zucchini Bread. Although his Double Chocolate Zucchini Bread has all of the appearances of cake, it technically is bread. And since normal Zucchini Bread is often enjoyed for breakfast & brunch I don’t see why this too can’t be deliciously devoured in the morning too! 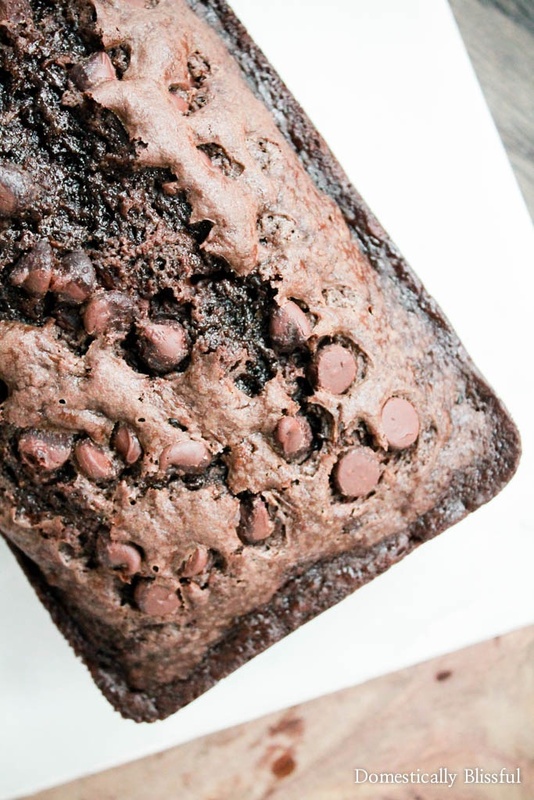 This Double Chocolate Zucchini bread has two types of cocoa powder mixed in, Nestle Toll House Cocoa & Hershey’s Special Dark Cocoa, & is filled with Ghirardelli Chocolate Baking Chips. I even added extra chocolate chips on top to make it look pretty & to let people know what goodies lay inside. And if you are fond of nuts in your zucchini bread you could easily add some to the mixture before baking. I added walnuts to one of the loaves particularly for my husband who loves walnut zucchini bread. Although I will admit, I prefer the whole thing to be simply chocolate. 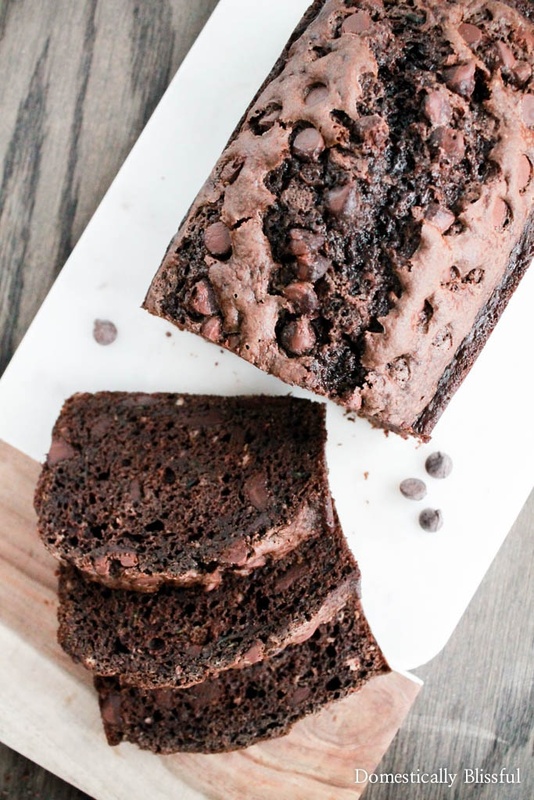 Chocolate zucchini bread with lots of chocolate chips! First, preheat your oven to 325 degrees Fahrenheit & spray 2 bread pans with oil. Blend the 3 eggs, 2 cups of sugar, 3 teaspoons vanilla, & 1 cup of sour cream into a large bowl. *1. If your zucchini is extra wet while packing/measuring you can squeeze out some of the liquid or pat it down with a towel to soak up some of the extra zucchini liquid. *2. I like to mix regular (milk chocolate) cocoa powder with dark cocoa powder. *3. I prefer my zucchini bread without walnuts so I usually do one loaf without for me & one loaf with (1/2 cup) walnuts for my husband. *4. Keep stored in a sealed container at room temperature for up to a week. 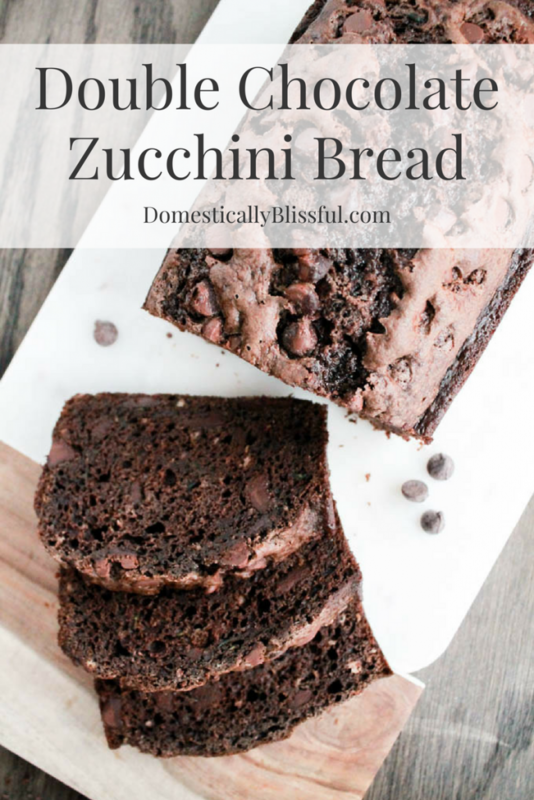 I’d love to hear what you think of your Double Chocolate Zucchini Bread! I have tried dozens of zucchini recipes over the years and this one is awesome! I used instant expresso powder in place of the coffee and mini chocolate chips instead of regular. I mixed about a cup of the chips in and sprinkled the remaining chips on top. It made 3 small loaves and 36 very dangerous mini muffins. The muffins also raised beautifully and popped out of the tins easily! I’m so happy you enjoyed your Double Chocolate Zucchini Bread & mini muffins! 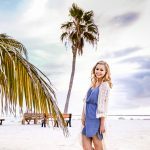 Thanks for sharing your success!